This is a collaboration post between Waffle Flower and Xyron. Waffle Flower sent the Xyron Design Team some stamp sets and/or dies. 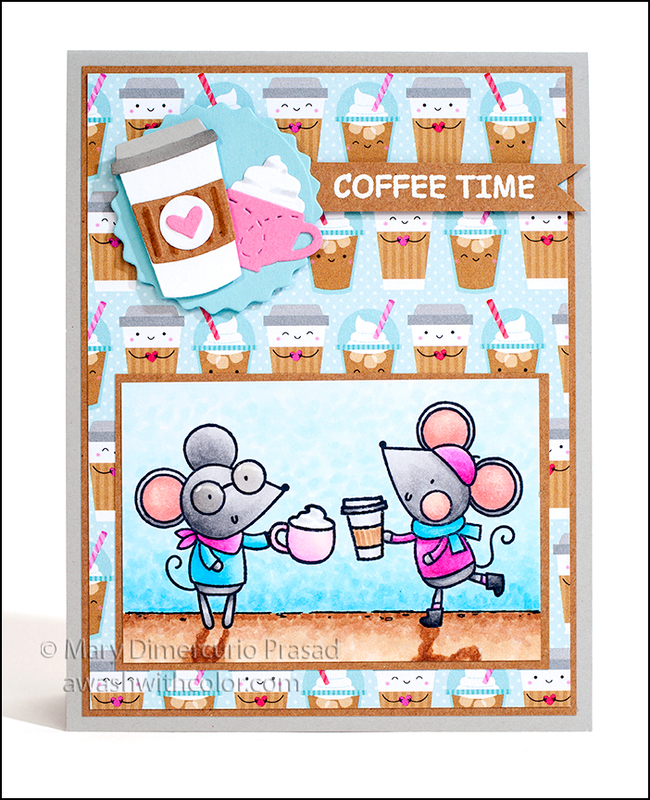 I chose the new Hello Pumpkin stamp set along with a mini stamp set Coffee Time. I thought these would go well together since Hello Pumpkin also had some coffee themed stamps. The mice are so cute! I decided to color them with Copic markers. I also added a couple coffee charms and a coffee cup pop-up by Karen Burniston. 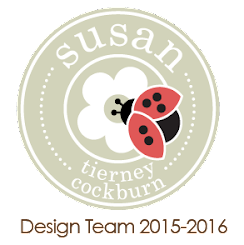 The Doodlebug Design papers Cream & Sugar was the perfect compliment for backgrounds. 1. 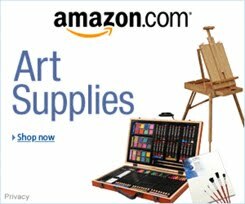 Cut light gray cardstock 4 1/4 x 11 inches; fold in half to form a 4 1/4 x 5 1/2 inch card base. Cut light brown/kraft cardstock as follows: one 4 x 5 1/4 inches, two 4 x 5 5/16 inches, and one 2 3/8 x 3 1/2 inches. 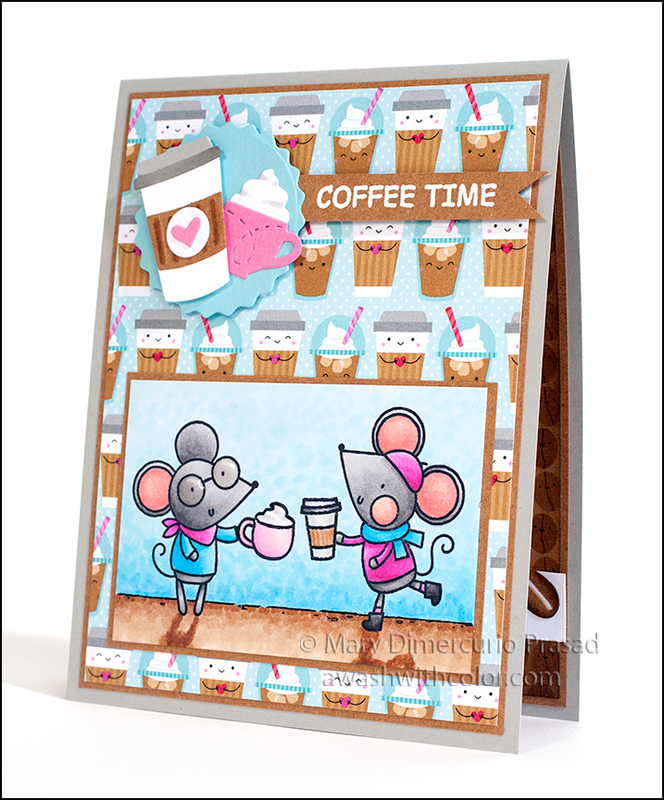 Cut Coffee Time paper (Cream & Sugar 12x12 Paper Pack) first 5 1/4 x 12 inches, then cut two off at 3 7/8 inches (they will be 3 7/8 x 5 1/4 inches) and one 3 7/8 x 5 1/8 inches. 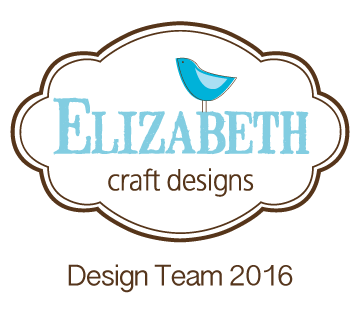 The smaller 5 1/4 x 12 will be for the front of the card so you will use the coffee cup side. The two 3 7/8 x 5 1/4 inch pieces will be used for the inside of the card on the coffee bean side. Orient the pieces as they will be inside the card. Use an ink blending tool to add Walnut Stain Distress Ink to outside edges, leaving the two edges towards the fold with just ink on the very edge. Note: I cut my pieces too short so there is a bigger gap along the fold in my card - I thought it would look better without the gap so I adjusted the measurements accordingly. Cut the coffee cup strip from the page of strips (Cream & Sugar 6x6 Pad); trim to 4 inches. Cut a strip of pink paper 1/8 inch larger (so it will stick out above/below the coffee cup strip at 1/16 inch on either side) by 4 inches. Cut Neenah Solar White cardstock 5/8 x 4 inches. Set aside for now. 2. Cut alcohol marker friendly cardstock (Neenah Solar White) about 2 1/2 x4 inches - you might want to lightly pencil in lines for an area 1 7/8 x 3 3/8 inches - this will be the final size; I like to add a little extra for coloring and wiggle room for cropping. Using a Stamp Platform, arrange mice, then add in coffee cups where their hands will hold them, gently moving mice out of way. I snugged these stamps right up next to each other. Stamp with Memento Tuxedo Black ink. At this time, you may also create a mask by stamping on masking paper or Post-it Tape then fussy cutting with detail scissors; alternatively you can just wipe the ink off the hands of the mice that will hold the beverages before stamping them. Remove beverage stamps, arrange mice, then stamp with Memento Tuxedo Black ink. Draw line for ground using a Copic Multiliner SP Black .3 (I prefer the SP versions - refillable, less waste, and more economical in the long run). Color image with Copic markers (see Supplies for the list of colors I used). Trim to 1 7/8 x 3 3/8 inches. Attach to 2 3/8 x 3 1/2 inch light brown piece (step 1) using Tape Runner or Mega Runner. Add glossy accents to mouse's glasses and pink coffee cup. Set aside to dry. 3. See photo below. Cut Neenah Solar White cardstock about 5x5 inches. Cut light brown cardstock 2 1/4 x 4 inches. Cut light gray cardstock 1 1/2 x 4 inches. Cut craft foam about 3x4 inches. From Coffee Cup Pop-up, die cut light blue/green cardstock using zig-zag circle. 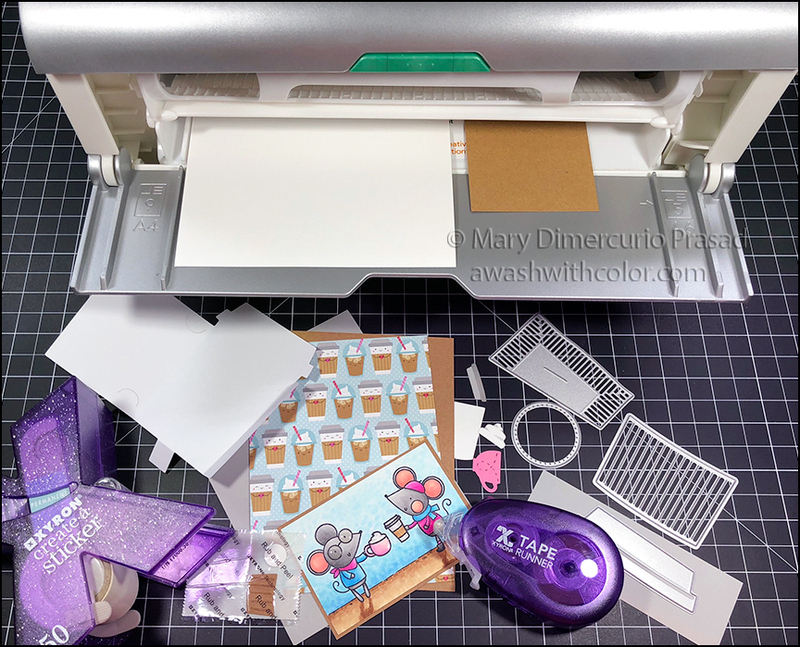 Watching which side should be up on patterned paper, run all cardstock/paper (except card base) from step 1, craft foam, and cardstock from this step through 9" Creative Station with permanent adhesive (you could put the strips through the 1.5" Sticker Maker instead). Cut pieces apart from each other (this will make it easier to die cut later). 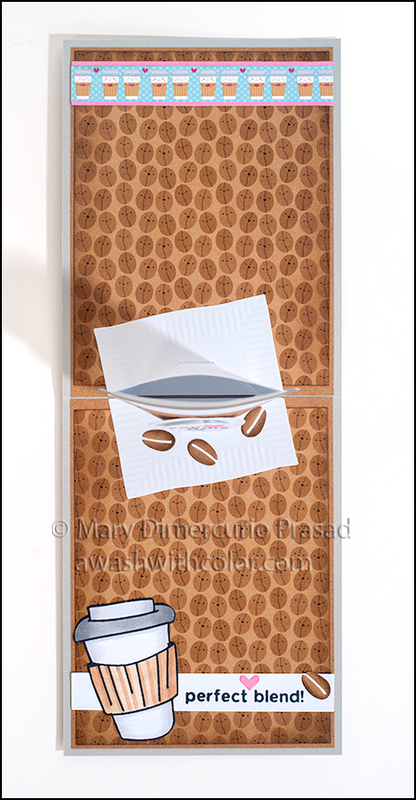 Adhere 3 7/8 x 5 1/8 inch Coffee Time paper to 4 x 5 1/4 inch light brown paper with coffee cup side showing; adhere to front of card. Note: pull backing away from cardstock/paper so they won't bend as much. If there is any sticky residue, use Adhesive Remover - it works really well. Adhere two light brown pieces (4 x 5 5/16 inch) pieces inside card on either side of fold, allowing a very small gap for fold. Adhere coffee bean papers (remember that mine have a bigger gap near the fold - yours should line up with the brown next to the fold). 4. 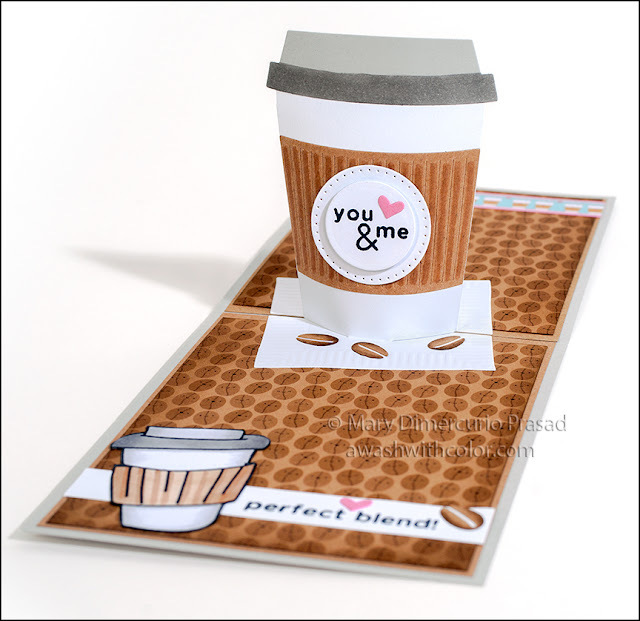 Using Coffee Charms dies, die cut whipped cream, paper cup, and circle label from Neenah Solar White cardstock, coffee cup from pink cardstock, coffee lid from light gray cardstock, and coffee sleeve from light brown cardstock. 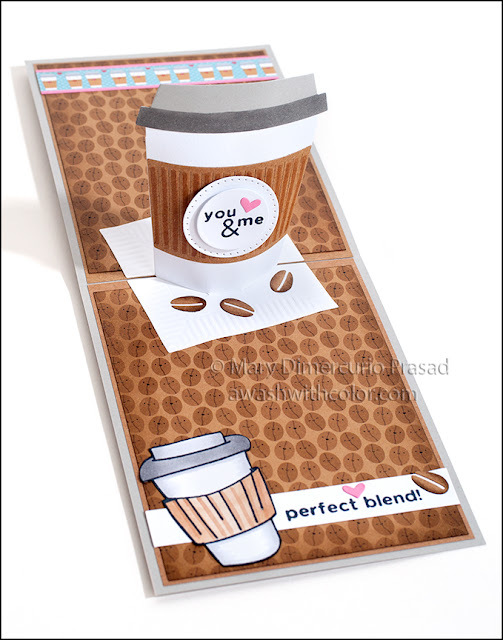 Emboss coffee sleeve if desired then use Copic E34 to highlight lines. Use Copic T3 to add shading to whipped cream and color bottom half of coffee lid. Using Coffee Cup Pop-up stir stick die, cut 3 hearts from pink paper. Run hearts, small coffee cup sleeve, and label through 1.5" Sticker Maker (see photo above, bottom - left of center; note I ran the hearts through separately). Adhere one heart to label, label to sleeve, then sleeve to paper coffee cup as shown in photo of front of card. Use liquid glue to attach lid to paper coffee cup and whipped cream to pink coffee cup. Run both coffee cups through 1.5" Sticker Maker. Adhere pink coffee cup to blue/green zig-zag circle (step 3); cut sticky backed craft foam to fit behind coffee cup with sleeve and stick coffee cup to it then stick to zig-zag circle as shown. Cut sticky backed craft foam to fit behind zig-zag circle; stick circle to it but do not add to card just yet. 5. Watch video below before die cutting and assembling so you know what you will be doing, but don't do anything else yet. 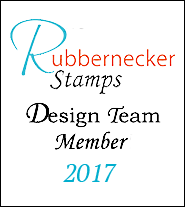 After watching the video, use the Coffee Cup Pop-up dies to cut white cardstock (65 lb recommended) using main coffee cup die. Using adhesive cardstock from step 3, die cut 2 napkin pieces, and plain circle from Neenah Solar White cardstock, coffee sleeve and coffee beans from light brown, and coffee lid from light gray. Use an ink blending tool to add a little Walnut Stain Distress Ink to outsides of coffee beans. Emboss coffee sleeve as shown in video. Use Copic E34 to add lines. Use T3 to shade bottom half of coffee lid. Adhere sleeve to front of pop-up coffee cup (if you are using it as a gift card holder, be aware of gift card tab orientation and adjust accordingly). Adhere lid. 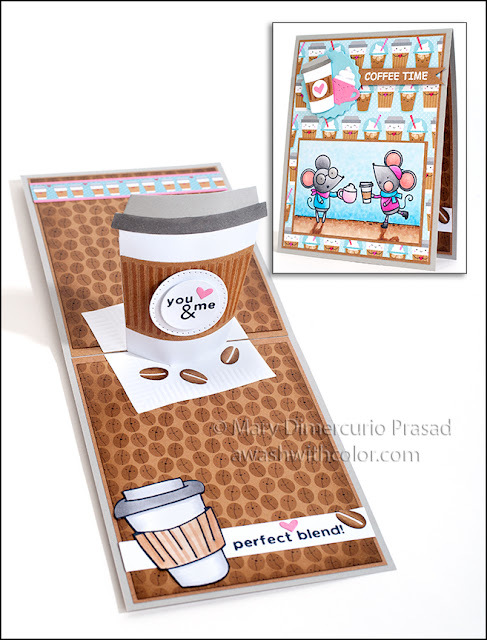 Assemble coffee cup on napkin and adhere inside card as shown in video. Adhere three coffee beans where shown (see photos of inside of card). 6. Look at coffee sleeve label in photo below. 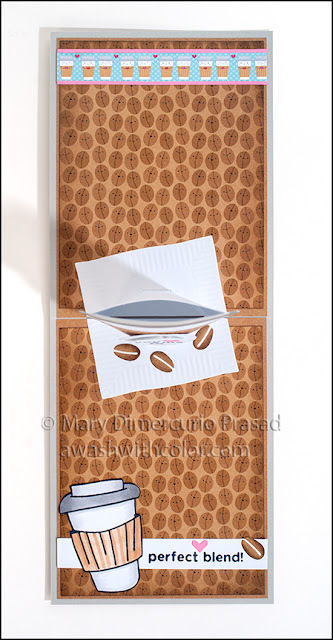 Die cut dotted circle (Coffee Cup Pop-up) from Neenah Solar White cardstock (without adhesive). On the plain sticky backed circle (step 5), stamp "you & me" (Hello Pumpkin) in Memento Tuxedo Black ink (use Stamp Platform to center). Add heart as shown. Cut sticky backed craft foam piece big enough to go behind circle; peel backing from circle then stick to craft foam on its non sticky side. Stick to dotted circle and glue to coffee sleeve as shown in video. Stamp coffee cup (Coffee Time) on sticky backed Neenah Solar White cardstock. Color with Copic markers. Fussy cut around cup using detail scissors. Use Tuxedo Black Memento Marker to go around outside from back to get rid of white edges. Stamp "perfect blend" (Hello Pumpkin) in Memento Tuxedo Black on white strip 5/8 x 4 inches, leaving room for coffee cup on left, coffee bean on right, and heart above - see photo below. Add to card where shown; adhere coffee cup, coffee bean, and heart. Adhere strip of coffee cups to pink strip; adhere to top inside card where shown. 7. 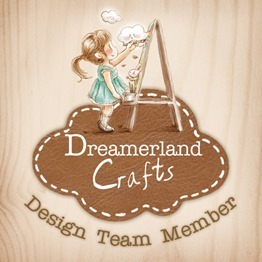 To finish the front of the card, cut a strip of light brown paper, about 3/8 x 2 1/2 inches. Place strip in Stamp Platform. Apply powder tool to strip. Using VersaMark ink stamp "COFFEE TIME" (Coffee Time) near left end, leaving about 3/8 inch. Heat emboss in white. Cut tails on right side with detail scissors. Cut a strip of sticky backed craft foam to fit under Coffee Time label. Adhere where shown, along with zig-zag circle with coffee cups (step 4). Adhere mouse scene to bottom of card front as shown using Tape Runner or Mega Runner (if you didn't run it through 9" Creative Station already). Follow my blog with Bloglovin so you won't miss any of the coffee blending fun!